On the weekend, when I can luxuriate in a long shower without rushing off to work, it’s great to pamper myself. That’s just what I did using Bioelements Vitalization Rich Intensity Body Cleanser -- with the pouf provided in the limited edition holiday kit. From head to toe, the clean-smelling lather provided a gentle touch, devoid of harsh chemical sulfates. I was immersed in a creamy foam that left my skin soft and moisturized. The ingredients are derived from coconut and formulated with pure essential plant oils and extracts. Specialists at Bioelements seek to design their products “to make a major difference in the appearance of your skin.” There are no artificial colorants or synthetic fragrances. The body cleanser contains natural botanicals, and it wasn't tested on animals. What more could you want in a body wash? This one is divine. 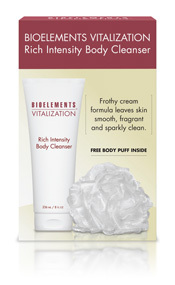 Bioelements Vitalization Rich Intensity Body Cleanser retails for $35.50 at bioelements.com.